A spectacular new image from ESO’s Wide Field Imager at the La Silla Observatory in Chile shows the brilliant and unusual star WR 22 and its colourful surroundings. WR 22 is a very hot and bright star that is shedding its atmosphere into space at a rate many millions of times faster than the Sun. 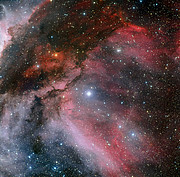 It lies in the outer part of the dramatic Carina Nebula from which it formed. Very massive stars live fast and die young. Some of these stellar beacons have such intense radiation passing through their thick atmospheres late in their lives that they shed material into space many millions of times more quickly than relatively sedate stars such as the Sun. These rare, very hot and massive objects are known as Wolf–Rayet stars , after the two French astronomers who first identified them in the mid-nineteenth century, and one of the most massive ones yet measured is known as WR 22. It appears at the centre of this picture, which was created from images taken through red, green and blue filters with the Wide Field Imager on the MPG/ESO 2.2-metre telescope at ESO’s La Silla Observatory in Chile. WR 22 is a member of a double star system and has been measured to have a mass at least 70 times that of the Sun. 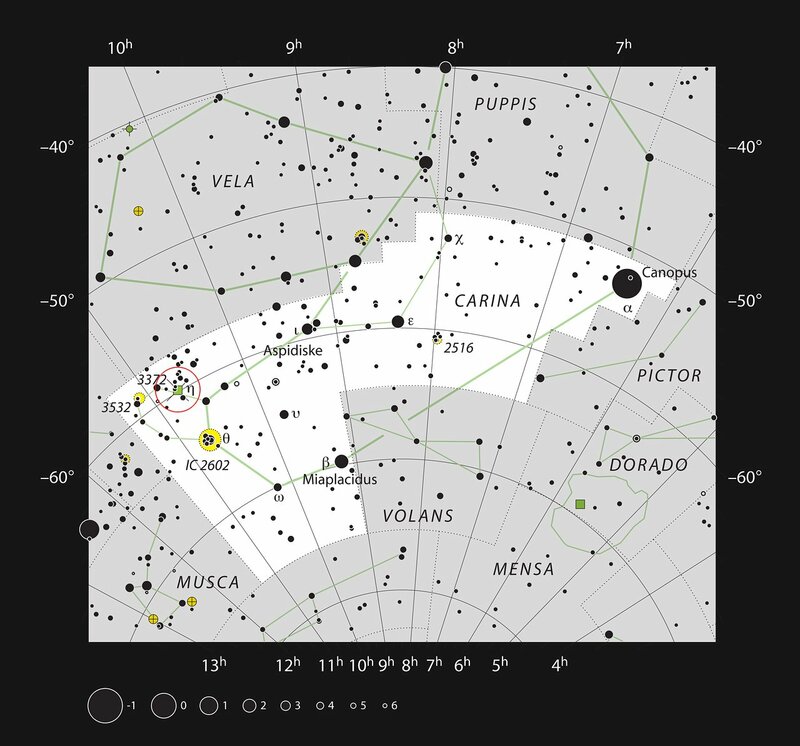 WR 22 lies in the southern constellation of Carina, the keel of Jason’s ship Argo in Greek mythology. Although the star lies over 5000 light-years from the Earth it is so bright that it can just be faintly seen with the unaided eye under good conditions. WR 22 is one of many exceptionally brilliant stars associated with the beautiful Carina Nebula (also known as NGC 3372) and the outer part of this huge region of star formation in the southern Milky Way forms the colourful backdrop to this image. The subtle colours of the rich background tapestry are a result of the interactions between the intense ultraviolet radiation coming from hot massive stars, including WR 22, and the vast gas clouds, mostly hydrogen, from which they formed. The central part of this enormous complex of gas and dust lies off the left side of this picture as can be seen in image eso1031b. This area includes the remarkable star Eta Carinae and was featured in an earlier press release (eso0905).